This is our LAST GIVEAWAY of the year and we are going to make sure you end 2011 in style! Join Shinan Govani (National Post Social Columnist, Author of the Novel Boldface Names), Anita Clarke (Fashion Blogger,iwantigot.com), John-Paul Ricchio (Principal of John-Paul & Associates), April Wozny (April Wozny PR) and Gail McInnes (Owner, Magnet Creative Management) as they countdown the New Year at Easy & The Fifth (225 Richmond Street West). OPEN BAR! Balloon Drop Midnight Countdown, Custom Party Favors, Lavish 'Masquerade' Decor, Live Entertainment, End of the Night Giveaways and Catering by The 5th Grill & Terrace. 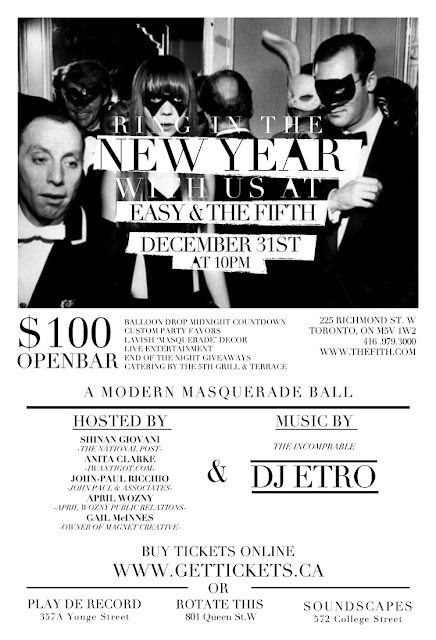 OR WIN THEM HERE by Tweeting "I want to countdown to 2012 at the Masquerade Ball at Easy & The Fifth #Toronto http://bit.ly/v1invj cc: @hipurbangirl". Winner will be selected by random draw on Wednesday, December 21 at noon. Good Luck! Thanks everyone for entering. This contest is now closed. 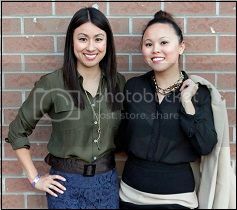 Congrats & happy holidays to our winner, Trish H of Toronto!